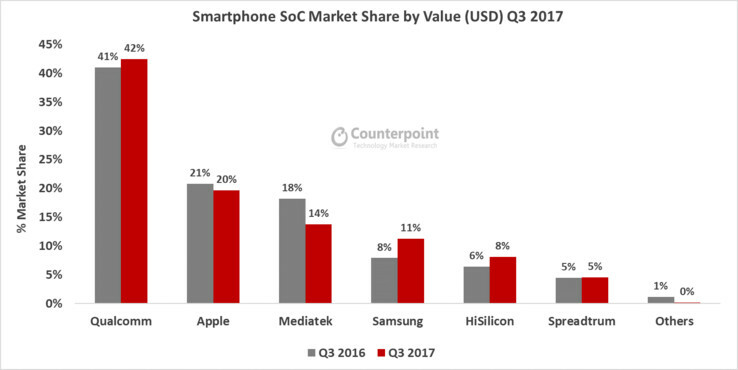 Qualcomm's place at the head of the SoC-manufacturing table is unchallenged, with the American company boasting of a massive 42% market share in Q3 2017. The smartphone SoC market is an interesting one, with competition between manufacturers keeping the industry progressive. That competition is almost non-existent at this point, though, as a report by analytics firm Counterpoint has provided data showing Qualcomm's unassailable position at the top of the market. According to the report, the American SoC manufacturers have an impressive 42% market share, a slight bump from their 41% share in Q3 last year. Apple comes in second with 20%, which is impressive, considering the fact that its market is limited to just Apple products. MediaTek are the biggest losers this year. The company, a few short years ago, provided some competition to Qualcomm—especially in the budget and mid-range segment—but that looks to be slipping away, as the company's market share has seen a drop from 18% in Q3 2016 to 14% in Q3 2017, the largest decline of all the players in the market. The company's upcoming Helio P40 and P70 look interesting, though, and we can only hope the Taiwanese manufacturers make a return to winning ways in 2018. Samsung comes in fourth, with its Exynos line owning 11% of the market in Q3 2017, up from 8% from the same quarter in 2016. Huawei's HiSilicon also sees a climb up from 5% to 8% Year-on-Year. Spreadtrum completes the list, as the company retains its position in sixth with an unchanged 5% market share.